BATTIBALENO is an International Non Profit Association that safeguards the Mediterranean environment, founded in July 1995 with the objective of improving the knowledge and perception of whales and dolphins regularly seen in the Mediterranean sea. Our goal is to preserve their natural environment, to learn from, get to know and love these animals through the spirit of sailing, with respect for their rules, a life on board and the environment. BATTIBALENO never steps above its sphere of competence, avoids an excessive position, raises up to defend whales, dolphins and turtles and other innumerable species, often victim of human activity through arrogance and violence. BATTIBALENO would like to develope among Sailors, professional and recreational, and sea lovers in general a great number of “Naturalist Navigators” able to represent in themselves the interests of our sea. BATTIBALENO uses all its resources to realize these projects of environmental safeguarding, founding every initiative on the constructive enthusiasm of all who feel involved and not to seek out for blame, those presumed guilty. 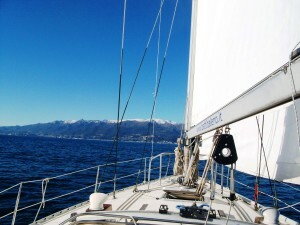 Lega Navale Italiana, Federazione Italiana Vela, Guardia Costiera, Guardia di Finanza, Carbinieri, gli Yacht Club, ICRAM (Istituto Centrale per la Ricerca Applicata al Mare) Acquario di Genova, Regione Liguria, Regione Toscana, Regione Sardegna, UCINA (Unione Nazionale Cantieri Industrie Nautiche e affini), Città dei Bambini di Genova, AMIU, C.R.E.A. (Centro Regionale di Educazione Ambientale), C.N.R. Area Liguria, Arpal Liguria, S.O.S. Grand Bleu, Association R.I.M.M.O., Université Internationale de la mer Antibes, GEA Program, Vivere il mare, Parchi e Parchi, FISPEMED (International Federation for Sustainable Development and Fight to Poverty in the Mediterranean-Black Sea), IWC (International Whaling Commission), W.W.F. Internationale (Mediterranean Programme) C.O.N.I., Saclant / NATO (mammals risk mitigation), Centre de Recherche sur le Cétacés- Marineland, SEAM (sistema educazione ambientale marina nel Mediterraneo) Scuole, enti e associazioni in Italia e all’estero. The first object of BATTIBALENO is the effective creation of an international reserve of marine mammals in the Mediterranean to transform this area into a zone of maximum protection for the cetaceous species that populates it. Particular thanks for their dedication go to the sailors and yachtsmen who have lent their time and experience, also to all the participating crews of Delphis.